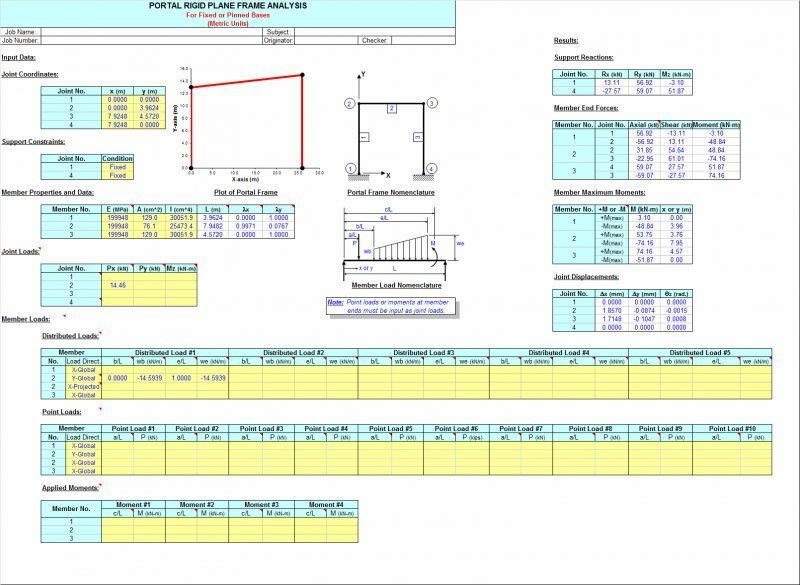 FRAME is a spreadsheet program written in MS-Excel for the purpose of plane frame analysis of portal and gable rigid plane frames subjected to various types of loading. Specifically, the "stiffness matrix" method of analysis is used to determine the unknown joint displacements, support reactions, and member end forces. Individual frame members are also analyzed to determine the shears and intermediate moments. Plots of both the shear and moment diagrams are also produced. Also, the frame is drawn for visual confimation of geometry/configuration. Members must be of constant cross section (E and I are constant for entire length). Deflections must not significantly alter the geometry of the problem. Stress must remain within the "elastic" region. Since this analysis is "first-order", the effects of "P-D", "P-d", and shear deformation are not included. Frame support joints may each be either fixed or pinned. Frame support joints may be at different levels (elevations). Columns must be vertical (cannot be sloped). For a portal frame, the top (roof) member may be flat or sloped in either direction. 3. A vertical load, horizontal load, and externally moment may be applied to any of the joints of the frame. These joint loads are to be applied in "global" axes directions. Note: Joint loads applied directly at supports are merely added directly to support reactions and are not reflected in member end force values. 4. On any individual member, this program will handle up to five (5) full uniform, partial uniform, triangular, or trapezoidal loads, up to ten (10) point loads, and up to four (4) externally applied moments. For vertical members, distributed loads and point loads are input in a "X-Global" sence of direction. For flat or sloped top (roof) members, distributed loads may be applied global over actual member length or applied global over the "projected" member length. 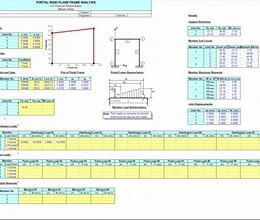 Program designations are "Y-Global", "Y-Projected", "X-Global", and "X-Projected".For a flat top (roof) member of a portal frame, "Y-Global" and "Y-Projected" loads produce the same results.Uniformly distributed gravity (dead or live) load would be an example of a "Y-Global" distributed load on a sloped top (roof) member, while lateral uniformly distributed wind load on sloped top (roof) member would be an example of an "X-Projected" distributed load. A uniformly distributed load such as wind suction perpendicular (normal) to a sloped top (roof) member must be resolved into Y-Global and X-Global component values by user. * FRAME download link provides freeware version of the software. FRAME has been rated 3.7 out of 5 points. A total of 3 votes cast and 0 users reviewed the software.